Barnard Griffin’s db Gallery & Studio GRAND OPENING! Student Show: Glassworks by the studio’s students will be on display in the Tasting Room Gallery. Noon-2:30pm: Presentation: “Interactive Kilnforming Discussion” led by Bullseye Glass Representative Sarah Givens. Please RSVP to reserve your spot. Demos: Includes glass cutting and pulling hot stringer with a Vitrigraph kiln. Glass Specials: 50% off Tekta sale. Plus, select from many gorgeous, one-of-a-kind sheets shipped in for this event. This well-equipped Bullseye Kiln-glass Resource Center is housed within Barnard Griffin Winery, one of the largest winemakers in Washington State. Co-owner Deborah Barnard opened the kiln-glass center in 2008 and now splits her time between running the db studio and producing artisan wine with her husband, Rob Griffin. She offers kilnforming workshops, a large inventory of Bullseye glass and supplies, and a gallery displaying fused works. Barnard Griffin is situated near the confluence of the Yakima, Columbia and Snake Rivers in south-central Washington—in the heart of the state’s wine country. Education is central to the mission of db Studio, which offers an array of kilnforming workshops for students at various skill levels. Deborah Barnard is the resident artist/instructor. Check the website often to see the schedule of current offerings. Future plans include a new outdoor covered kilnworking studio. Architectural plans will be on display during the Open House. 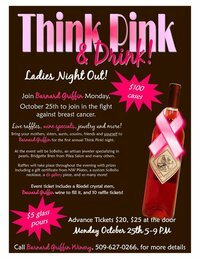 Barnard Griffin Winery’s THINK PINK & DRINK! Live raffles, wine specials, jewelry and more! Bring your Mothers, Sisters, Aunts, Cousins, Friends and Yourself to Barnard Griffin for the first annual Think Pink! night. At the event will be SoBello, an artisan jeweler straight from Shanghai with her Trunk Show ~ specializing in pearls, Deborah Barnard and her gallery showcase, along with Brigette Bren from Pilea Salon and many others. Raffles will take place throughtout the evening with prizes including a gift certificate from NW Pilates, a custom SoBello necklace, a db gallery piece(think pink) and so much more! Event ticket includes a Riedel crystal stem wine glass, Barnard Griffin wine to fill it, and 10 raffle tickets! A portion of the nights proceeds will benefit breast cancer research through the American Cancer Society. Call Barnard Griffin Winery, (509) 627 0266, or email for more details. Think Pink & Drink. What a great way to have fun and contribute to a great cause at the same time!